This stands as a pioneering document of what may yet prove to be a new new world order. Watching the spectacle of the 2008 Olympics in Beijing -- in which transnational capital cozied up to Chinese totalitarianism and showed the world that they might not be so incompatible after all -- it was easy to forget that there are those who haven’t yet bought into the idea that there is no alternative. (Tibetans? Those bespectacled bald guys wrapped in yellow sheets? They still around?) 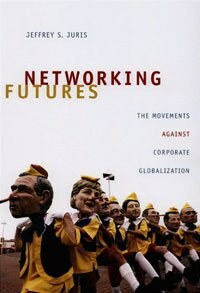 In the wake of Michael Phelps’s pot o’ gold kerplunking into the water, comes Jeffrey Juris’ book Networking Futures: The Movements Against Corporate Globalization. Juris’ book is a result of nearly a decade’s research on the various movements for alternative globalization, from their first emergence in the public eye during the Battle of Seattle in 1999 to last year’s US Social Forum in Atlanta, Georgia. There are stops in between in Barcelona, Prague, and Porto Alegre, Brazil. The author, a 2004 PhD and now assistant professor of anthropology at Arizona State University, didn’t just observe his research field, he lived in the middle of it, squatting with activists in Europe and taking part in hundreds of meetings and discussion groups as well as many of the major alt-globalization actions of recent years. The view Juris offers is more in-depth than has been generally reported even by sympathetic journalists such as Naomi Klein, whose book Fences and Windows covers a lot of the same territory but with less detail. Basically an academic text, the book also puts a conceptual framework around the events and interactions in which Juris participated to explain their significance. A major theme that emerges is how digital network technology reinforces certain social norms and political forms of the alt-globalization movements. The spoke-and-hub architecture of online networks, for example, mirrors a political organizational structure in which individual groups retain their autonomy but communicate with one another to coordinate their actions. That horizontal hierarchy, in which no one node is essentially "in charge", also reflects the egalitarian culture new social movements espouse. There’s also the fact that alt-globalization doesn’t reject globalization per se, but the way it’s evolving under transnational corporate rule, and so it fittingly turns the information-processing and telecommunications tools of global capital against itself, much in the way that the literacy that indoctrinated colonized peoples into Christianity through studying the Bible also permitted them to read the The Communist Manifesto and thereby come up with liberation theology. While average readers will perhaps find the point nerdy, those with a social science bent ought to appreciate Networking Futures at least for the alternative example it offers to traditional research methods, especially as typically practiced in America. Ever anxious about the scourge of subjectivity (and therefore susceptibility to accusations of being inconsequential), conventional social science is constantly on the make to display its “hard” science credentials. One way it does this is a predilection for quantitative research. (‘Math is hard’ as Barbie says, or is it GI Joe?) It’s also displayed in the presumption of objectivity, classically set out by Max Weber as the ideal of acting sine ira et studio, that is, without passion or interest. The postmodern reformer’s position embraces something called ‘reflexivity’, acknowledging self-awareness of one’s situation in the constellation of social positions vis-à-vis the object of study. Juris goes a step further, adopting what he calls ‘militant ethnography’, a research agenda that seeks to advocate as well as understand. Juris has no qualms about his dual identities as both as observer and participant, researcher and activist. In fact, he asserts that ‘going native’ is the only way to really get what alt-globalization is all about. Physically joining in on protest actions, feeling the sting of tear gas, being overcome by fear of the police truncheon about to come down, but also the exhilaration of collective contagion and feelings of group solidarity is an essential part of documenting these new social movements as they are in the making. A good portion of the book is taken up reporting field research. There’s a chapter on the aesthetics of direct-action protests, laying out the color coding of different march columns in which various positions are organized -- white overalls and padding for civil disobedience where some police retaliation is presumed, pink and silver for frivolity and festivalism, symbolic, unruly play set in contrast to buttoned-up official ‘business as usual’ of the transnational suits, black bloc for militant action, including calculated property damage, primarily against corporate targets, etc. Another chapter maps out various alt-globalization constituencies -- the ‘institutional’ wing comprising progressive political parties and trade unions, the ‘critical’ sector of non-governmental organizations, the ‘network-based’ units of direct democracy, such as the Movement for Global Resistance and Peoples’ Global Action, and ‘autonomous’ elements, including squatters and indigenous peoples’ groups. These mappings are augmented by reports of actions in which Juris took part, from the heady days of Seattle, Barcelona, and Prague to the terror of Genoa and the discontent in its aftermath. There’s also a bit of history, tracing alt-globalization to the grassroots, peasant, and indigenous peoples’ movements in the 1970s in the Global South, especially Latin America, the first region to be subjected to the then new ideology of neoliberalism as Milton Friedman and his wrecking crew ‘adjusted’ Chile’s economy after ‘Little September 11’ (the date in 1973 when dictator Augusto Pinochet assumed power in a military coup d’etat that ended in the death of popularly elected president Salvador Allende). This history, while generally well told, could have given a little more attention to Northern unionists, who actually accounted for some two-thirds of the protestors on the street in Seattle. At several points, Juris credits alt-globalization with achieving ‘symbolic’ victory in its struggle against transnational capital. But that begs the question as to what has been tangibly accomplished. It’s true as Nobel Laureate and former World Bank economist Joseph Stiglitz says that the alt-globalization movements do appear to have succeeded in putting certain issues on the table, although one can well argue that so far talk has been cheap. Resistance in South America has been more concretely bolstered by the electoral mandate of several progressive governments who are refusing go along lock, stock, and barrel with the neoliberal transnational agenda. Capitalism in the United States seems to be doing a pretty good job of bringing itself to its knees through the cupidity, venality, and hubris of its own agents, without the help of outside activists. What’s known as the Doha round of free trade negotiations collapsed this summer not because of the alt-globalization movements but because the two biggest parties, India and China, wouldn’t submit to the rules of a game they saw as rigged against them (a clear example of God blessing the child that’s got its own). The force of Juris’ close-up perspective needs to be set alongside an understanding of the dark side’s structural apparatus to make clear just what it is the alt-globalization movements are up against. Naomi Klein’s most recent book The Shock Doctrine is a timely place to start, although I recommend David Harvey’s Brief History of Neoliberalism and William Robinson’s Theory of Global Capitalism as more substantial yet still readable. That noted, Networking Futures stands as a pioneering document of what may yet prove to be a new new world order. That makes it important enough for me.